Now, can we quit talking about it? If you’re like me, your news feed has been lit up in the past 48 hours about this issue. I will be brief. Through the various pages and accounts I manage, I have access to about 20,000 friends/fans/followers online. Most of the people in that group are Christians, and while that is a relatively small number in comparison to the whole internet, I would argue that it still represents an accurate sampling of the evangelical church and it is far more than required for a scientific study. In this crowd I have not seen a single person – not one – actually say that they are upset about the Starbucks cup. So where did it come from then? It started last week when a conservative news site (I’m choosing not to post the link on purpose to not give them any more traffic) known for its huge sweeping over-statements posted something about how the move to a solid red cup away from last year’s snow flake design is some how a sign of impending doom for Bible-believing Christians who want to say “Merry Christmas” without getting pepper sprayed in the face. The source most of the internet probably heard it from was Buzzfeed, that bastion of journalistic accuracy. Buzzfeed posted a link to the original article and five tweets – FIVE TWEETS – by angry Christians some of whom clearly had little understanding of what was happening as it seemed like they may have thought Starbucks was a former Christian denomination that had fallen from grace, based off these tweets. Yes I’m sure there were many more than five to be found elsewhere and yes there are many more now, but I was amazed when I found the buzzfeed article. 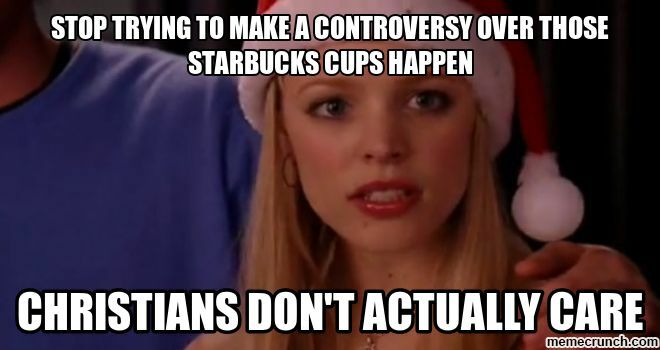 I was sure there would be HUNDREDS of angry tweets about the red cup based on the backlash. But no, turns out this “controversy” didn’t have much of a movement behind it at that point. This article only served as fuel for the fire and anything else – on either side – has grown from there. This disproves Newton’s third law, you know, that says every action will have an opposite but equal reaction, because the initial action was some yellow journalism on an obscure, foreign site. The reaction has been to fill my feed with pictures of the red cups that could stretch around the planet twice. So what I’m saying is this: we need to get NASA involved because this kind of controversy could be the breakthrough we need to get to Mars! It only takes a tiny little bit of “controversy” to fuel an enormous reaction. So let’s quit calling this vast minority of people idiots and get back to what we should really celebrate this December – the new Star Wars movie.